Could Tranexamic Acid Bias the Optimal Ratio of Fresh Frozen Plasma to Red Blood Cells During Massive Transfusion? To the Editor We read the study by Mesar et al1 with great interest. 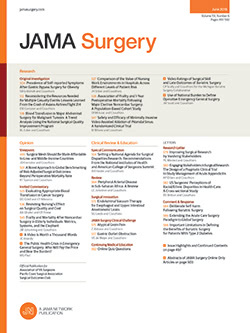 In their retrospective study, the authors found no significant difference in mortality between 2 strategies of massive transfusion based on a high transfusion ratio or low transfusion ratio of fresh frozen plasma to red blood cells.1 However, at the opposite end of studies dealing with massive transfusion in trauma patients, the authors do not mention the use of tranexamic acid, which is recommended in massive transfusion protocol, and this medication may have been given in massive transfusion occurring during surgery.2 Moreover, the use of tranexamic acid has been purposed as a prophylactic agent to decrease surgical bleeding, notably in cardiac surgery, which constituted a large population in the present study.3,4 We wonder whether this could be a potential confounding factor in the analysis and the interpretation of the results. Indeed, the use of tranexamic acid may have curtailed the requirements of supplementary fresh frozen plasma and thus contributed to minimize the difference between the high and low transfusion ratio of fresh frozen plasma to red blood cells.